“I want a diamond that looks white and has a lot of sparkle! A diamond’s color is graded on a scale from D to Z. A “D” color diamond is colorless, totally without color while a “Z” color diamond will have a significant yellow tone. Most engagement rings sold are in the G-M color range. Your ring could fall anywhere in this scale based on your personal preference. “D” color diamonds are much rarer than other diamond colors, as such, color does affect the price. The clarity of a diamond refers to the amount, size, location, and nature of imperfections in or on the surface of the diamond. Those imperfections on the inside are called inclusions, and those on the surface are called blemishes. Clarity is based on a scale that ranges from Flawless to Imperfect. It is safe to say that most clients are looking for a diamond that does not have imperfections that are easily visible to the naked eye. Clarity also affects the price. Next, we have carat weight. A 1.00 carat diamond is divided into one hundred equal parts called points. Points in a carat are like pennies in a dollar; there are one hundred points in a carat. It is believed that the word “carat” is derived from the South American word “carob” which is a chocolate seed that has the same weight as a one carat diamond. As you can well imagine, carat weight is also a factor in determining price. The final “C” is cut. Cut doesn’t only refer to the shape of the diamond, but also to the angles and proportion of the diamond. While nature determines the other three “C’s”, cut is the only human factor. The diamond’s cut is determined by the diamond cutter. A well cut diamond reflects lights from one facet to another and projects light through the top of the stone, producing sparkle and brilliance. A well cut diamond will sparkle more than a poorly cut diamond, even when the diamond is dirty from day to day wear. The physical shape of the diamond can also be referred to as “cut”, such as round brilliant, princess cut, pear-shape, oval, and marquise, just to name a few. This is an area where your personal style can come into play, and you can enjoy exploring all of the options. 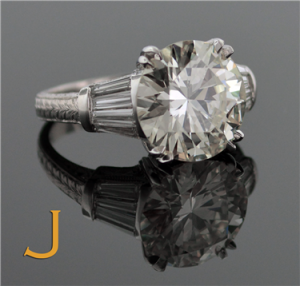 Next, the budget: “How much does it cost?” Here at Joden, we offer engagement rings to fit every budget. We have one of the largest and most diverse inventories in this part of the country. Our engagement rings range from a delicate filigree diamond ring from the Art Deco period that sells for $500 to a 6.05 carat emerald cut diamond in a custom platinum mounting with a price available upon request. We work with vendors worldwide to bring you the finest collection of diamonds and mountings. I have no doubt that we can provide the perfect ring for you. And finally, financing: “How do I pay for it?” Joden Jewelers offers several options for payment. We accept cash, check, and all major credit cards. In addition, we have a flexible layaway plan and we also offer interest-free financing to all that qualify. It could not be easier. Now that we have walked through the basics of diamonds, you are better prepared to begin your journey. As you embark upon the quest for your perfect engagement ring, many of these facts will be repeated to you. Arm yourself with the knowledge that we have provided, get those three questions answered “Is it pretty? How much does it cost? How do I pay for it?”, and of course, come to Joden.